I have been married 64 years and have 3 children. I retired at 62, and have been a year member of the Elks for 35 years. I have served as a scout master, Little League President, Finance Officer at my Church. I’m always willing to help but have had to slow down lately. 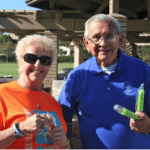 My wife Joan is the leader of the Anaheim Parkinson’s Disease support group. I try to keep this on the happy side, I’ve got it so that is not the end, I have found other things that I can do, I now sing with the Tremble Clefs and the Church Choir. I am not a good singer but I keep them laughing. I try to speak to any one with Parkinson’s Disease to let them know we can continue on. I still do all the things I used to, but it takes longer. It is so important to have an understanding wife and family.